If you have e-mail, you have spam—that annoying electronic junk mail that jams your inbox, sometimes makes you blush, and takes a lot of the fun out of your online experience. Spam wastes thousands of hours and costs you, the recipient of the stuff you don’t want, thousands of dollars in increased costs that your Internet service provider eventually passes along to you. In fact, a European survey in 2001 revealed that spam costs about $9.4 billion each year! The ultimate solution to spam has yet to be found, but these Internet-savvy authors give you the tools to help level the playing field. They also offer some solid suggestions for anti-spam laws and how you can join the war on spam. JOHN R. LEVINE and MARGARET LEVINE YOUNG are the bestselling coauthors of numerous books, including The Internet For Dummies. RAY EVERETT CHURCH is Chief Privacy Officer for ePrivacyGroup.com. Part I: The World of Spam. Chapter 1: How Spam Works — and Drives You Crazy! Chapter 2: How Spammers Get Your Address. Chapter 3: There Oughtta Be a Law Against Spam! Chapter 4: Talk to the Hand ’Cuz the Spammer Don’t Care. Part II: Filtering Spam Out of Your Inbox. Chapter 5: Mailbox Filtering in Your E-Mail Program. Chapter 6: Filtering Spam in Outlook Express and Outlook. Chapter 7: Filtering Spam in Netscape and Mozilla Mail. Chapter 8: Filtering Spam in Eudora. Chapter 9: Filtering Spam in AOL and AOL Communicator. Chapter 10: Filtering Spam in Hotmail, MSN, and Yahoo! Mail. Part III: Spam-Filtering Programs and Services. Chapter 11: A Round-Up of Desktop Antispam Programs. 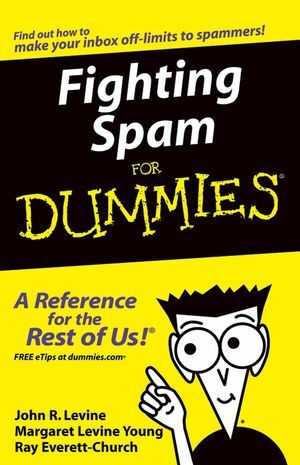 Chapter 12: Antispam Services for Just Plain Folks. Chapter 13: Server-Side Spam Filtering for Network Administrators. Chapter 14: Ten Spam Scams. Chapter 15: Ten Internet Annoyances and How to Get Rid of Them.